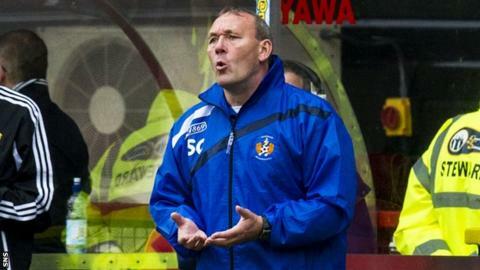 Kilmarnock have confirmed that Sandy Clark has stepped down from his role as the club's assistant manager. The 57-year-old assisted Allan Johnston at Queen of the South before both moved to the Ayrshire outfit last summer. Their debut season was at times a struggle, but they guided Killie to Scottish Premiership safety. "Sandy's wealth of experience was an important factor in the club pulling clear of the relegation play-off," a Kilmarnock statement read. "Allan Johnston‎ wishes to record his disappointment that Sandy has decided to leave the club, and extends his sincere thanks to Sandy for his dedication in making their partnership so successful at Queen of the South, winning two trophies and helping Allan to achieve the 2012-13 'Manager of the Year' award." Killie revealed Clark, who previously coached at Rugby Park under manager Jimmy Calderwood, had left to "pursue other opportunities". After playing spells north and south of the border, Clark managed Partick Thistle, Hearts, Hamilton Academical, St Johnstone and Berwick Rangers before being part of Calderwood's coaching team at Aberdeen and then Kilmarnock.